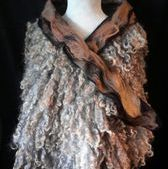 Beautiful tan loose locks shawl with a collar embellished with silk fibers. 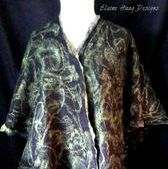 Nuno felt silk kimono made with Habotai silk and a very fine merino wool. 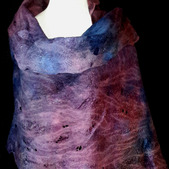 Nuno felt silk wrap created with Habotai silk, merino wool & silk fibers. 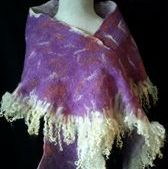 Natural color lock shawl made with Leicester locks. 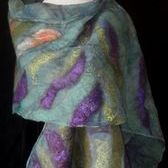 Nuno felt silk wrap made with Habotai silk, merino wool fibers and various mixes of silks for the mosaic design. 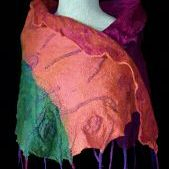 Nuno felt silk poncho created with Habotai silk, merino wool fibers and silk threads for a vibrant, colorful splash of color. 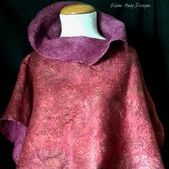 This wrap was created with a very fine grade of merino wool fibers which is very soft next to the skin. 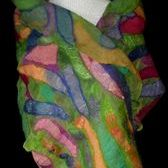 Nuno felt silk infinity scarf made of Habotai silk, merino wool and silk fibers. 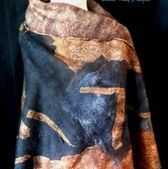 It is large enough to be wrapped into a cowl & draped over the shoulders. 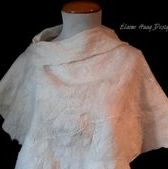 Nuno felt silk poncho created with Habotai silk, merino wool and silk fibers. 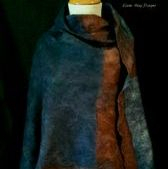 Nuno felt silk wrap was created with a base of Habotai silk, topped with merino wool fibers and strips of various colors of silk. 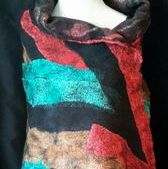 Nuno felt silk wrap inspired by the colors of some of my favorite football teams. 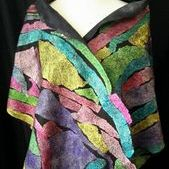 So, pick your team and this wrap will be the hit at your tailgate party or social event. 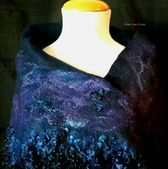 Nuno felt silk wrap which has a base of Habotai silk, topped with merino wool fibers and embellished with lace and silk strips. 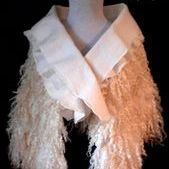 Nuno felt silk capelet which was left undyed. A little red for the upcoming holiday season. 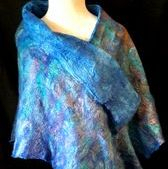 Reversible Nuno felt silk poncho created with Habotai silk, merino & silk fibers. 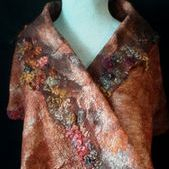 Nuno felt silk oversized cape which is inspired by the fall foliage and the colors of the creek my our house. 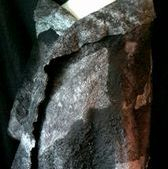 Reversible Nuno felt silk poncho with a cowl neck collar. 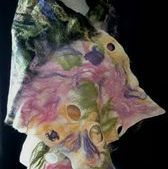 Created with Habotai silk, merino & silk fibers. 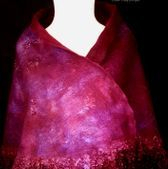 Reversible Nuno felt silk oversized cape is created with Habotai silks, merino & silk fibers. 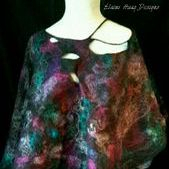 This is such a fun and sophisticated loose lock shawl. It is definitely a conversation piece! 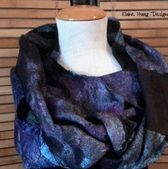 Nuno felt silk infinity scarf which can be wrapped into a cowl. 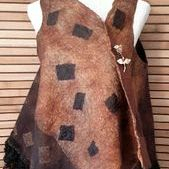 Fun to wear and perfect for fall & winter season. 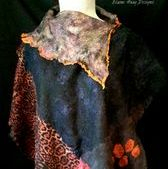 Created with Habotai silk, merino wool & silk fibers. 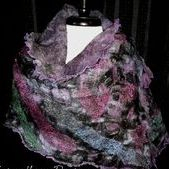 Nuno felt silk infinity scarf, wrapped into cowl. 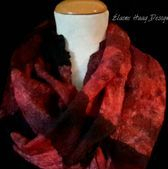 Perfect for fall & winter season. 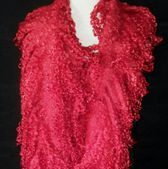 Nuno felt silk infinity scarf which will be perfect for the holiday season. 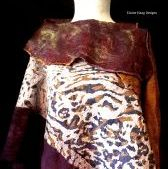 Made of Habotai silk and merino wool fibers. 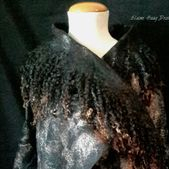 Felted cape with loose locks fringe. 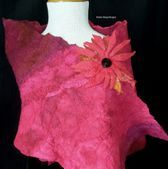 This capelet has a merino wool base and is embellised with silk fibers. 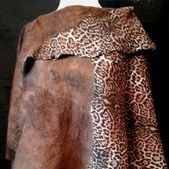 The collar has black locks with light tan tips. 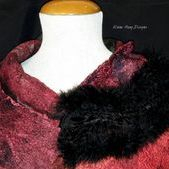 Felted cape with a loose lock collar. 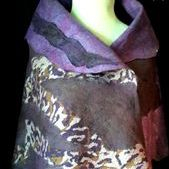 Nuno felt silk wrap, created with various types of silk,very fine merino wool and mulberry filk fibers. 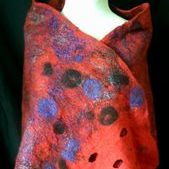 Reversible felted wrap created with merino wool, mulberry and sari silk fibers. This is the reverse side of "Holey Moley wrap. 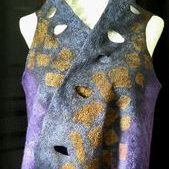 Nuno felt silk sleeveless vest, created with habotai silk, silk crepe and mulberry silk fibers. 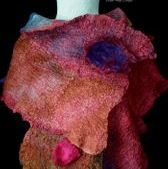 Nuno felt silk sleeveless vest, created with habotai silk, silk crepe and teeswater loose locks. 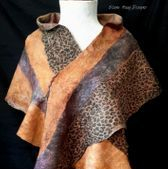 Nuno felt silk wrap with Boho style. 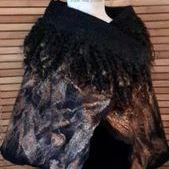 Nuno felt silk cape with freestyle stitching. 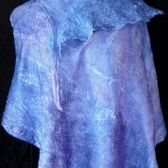 Nuno felt silk cape named after the main character in the book, When I am An Old Woman I Shall Wear Purple. 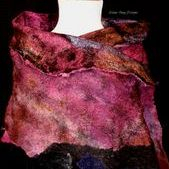 Felted wrap created with merino wool, mulberry silk fibers and Teeswater locks. 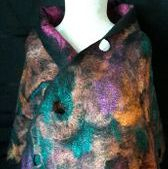 Reversible Nuno felt silk poncho. 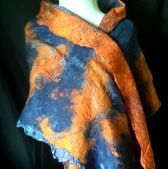 Reversible Nuno felt silk wrap. 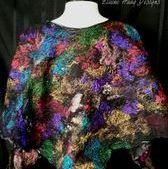 Nuno felt silk reversible poncho. 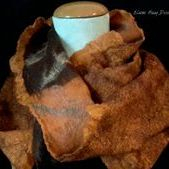 Nuno felt silk wrap created with habotai silk, merino wool fibers, mulberry silk fibers and loose locks. 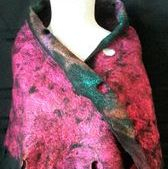 Merino wool wrap with mulberry silk fibers and locks. 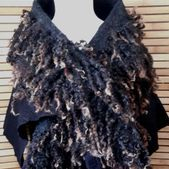 Make a fashion statement this season in with this lovely boa. 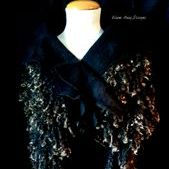 Nuno felt silk wrap embellished with black burnout velvet and black boa fringe. 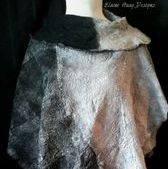 My first piece created in 2019 and named for my sister Linda who passed away in 2018. 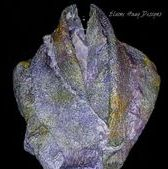 Nuno felt silk scarf, created with silk gauze, habotai silk , silk chiffon and merino wool fibers, 2019. 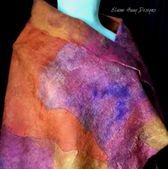 Nuno felt silk scarf/wrap created with silk gauze and merino wool. 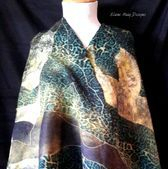 Nuno felt silk wrap created 2019. 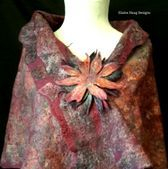 Created by wet felting method using silk laps, finer merino wool fibers and pre-felts. March 2019. Light as a feather and will be a "Joy" to wear. 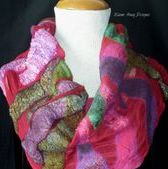 Easter colors adorn this scarf/wrap.